Well, seeing as my weight has crept back up to 108 Kg - that's 17 Stone to you guys - I decided a bit of a hike was in order on Saturday so I yomped along the North Downs (which are South of London, by the way) for a few hours. As we're still in a (for us) cold spell and have been since before Christmas, I wasn't expecting much in the way of harbingers of Spring. 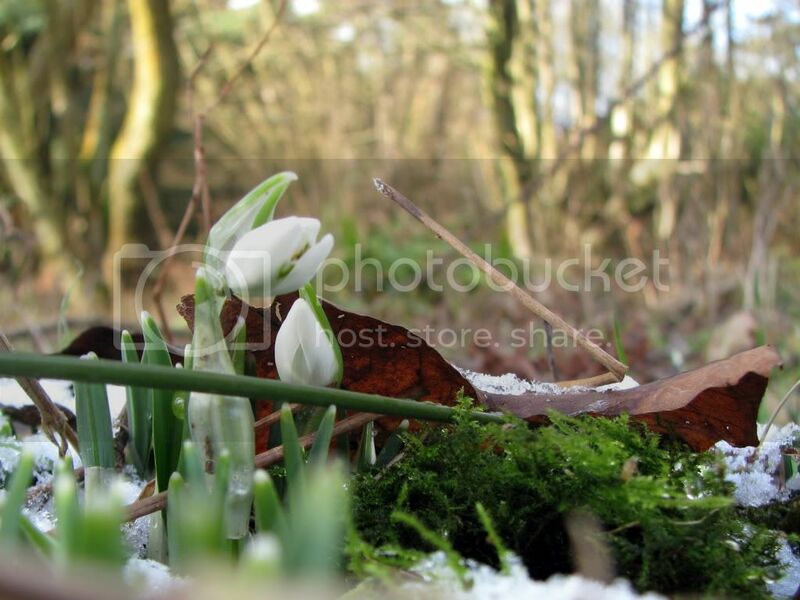 But I came across this little stand of Snowdrops pushing their way through the frozen ground. Here's hoping you have authority in this. by seanferd · 9 years ago In reply to Spring is on the way! I'll be looking forward to delivery of said Spring. by Tig2 · 9 years ago In reply to Spring is on the way! I didn't realize how desperate I have been for a glimpse of something green and growing! I was surprised to see them yet as it has been cold here for over a month. Though this time last year, to the day, they were fully out. Next comes the hazel catkins, then coltsfoot, primroses and daffodils and we're on our way. I'll post some more photographs once I have them. By the way, my knees got SO dirty getting the photographs! Blackthorn (May) is the real sign that Spring is here. "Don't cast a clout 'til may is out!". I can send you a photo of what's in my refrigerator. And sadly, true for me. by AV . · 9 years ago In reply to Spring is on the way! Spring is still a long way off over here. Brrr. Its cold, gray and we're expecting another Nor'easter this weekend. Thanks for the lovely picture, Neil. It cheers me up. You always take such great pictures. I still use your picture of Bluebells in a meadow that you took a while back as my Spring wallpaper. Snowdrops are a welcome sight. I still have to get through autumn and winter first. I think I posted that three years ago! April, 2007.
by .Martin. · 9 years ago In reply to Spring is on the way! by neilb@uk · 9 years ago In reply to looks good. What's the weather like where you are at the momemnt? Better than here and a LOT better than where Tigger is freezing!